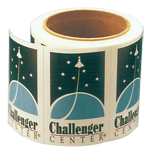 Labels can be laminated prior to numbering, but not after numbering. Used for added protection against scratching and weather. Adds a nice gloss to your custom label. Most durable and crystal clear. Inexpensive, good protectant, not recommended when covering large dark printed areas. If we are doing your artwork, time starts after proof is"approved." "4-color process & spot color jobs take approx.